In addition to carbohydrate and fat, protein is one of the most abundant nutrients in our diets. But not all protein is created equal. High quality protein contains all the essential amino acids needed by the body in amounts that are nutritionally adequate. Protein Powder is a highly efficient, scientifically advanced protein enhancement product. 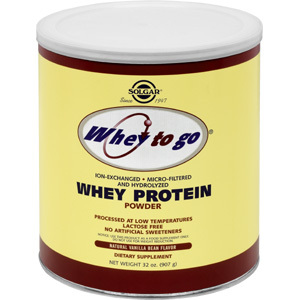 It is formulated with a blend of three, uniquely processed whey protein concentrates. Each proces: ion-exchange, micro-filtration and hydrolyzation adds to Whey To Go Protein Powder’s amino acid availability, absorption and protein utilization. Protein Powder also includes two beneficial ingredients, free-form L-Glutamine and free-form Branched Chain Amino Acids (BCAA’s). L-Glutamine plays a significant role in supplying muscle mass. BCAA’s help promote protein synthesis which assists in decreasing the breakdown of muscle under stressful conditions. Both L-Glutamine and BCAA’s are used by muscle tissue as a source of energy. In addition, Solgar’s Whey To Go Protein Powder is free of starch and lactose and is low in fat. Plus, its deliciously rich chocolate flavor blends easily and tastes great in water or your preferred source of milk. It can even be added to sauces, yogurt, muffins, panckaes, and other bake mixes. It is an excellent way to add extra high quality protein to your daily caloric intake. As a dietary supplement for adults, mix 20 grams (approx. 1 level scoop) in 8 ounces of water, milk, or your favorite juice and blend or shake vigorously. May also be blended with fresh fruit. Please note the additional calories and/or protein provided by milk or juice. This product also contains phenylalanine; therefore, the use of this product is recommended under supervision of a healthcare practitioner for those with phenylketonuria (PKU). †† Supplying ß-lactoglobulin, a-lactalbumin, casein glycomacropeptide, immunoglobulin, bovine serum albumin, residual caseins, protease peptides, and lactoferrin. ††† Whey protein is derived from milk. This protein powder is amazing. I recommend this to anyone because everyone in my family loves it, even my children. This protein is great. It is pretty pricey but it is worth the price because it tastes just perfect. This one doesn't get you bloated like other protein supplements. Whey To Go Protein Powder Natural Vanilla Bean Flavor is shipped in a discrete, unmarked package. Orders are processed immediately and usually take about 3 to 5 working days to be received. We do ask that you try it for 2 to 3 weeks to feel the full effects. Any information received is used only for order processing and shipping purposes. Your information, such as e-mail address, will never be disclosed to a third party.